After rather a longer wait than we had hoped, we now have our AHRS / GPS / Baro sensor boards back in stock. For those who already have a FlightBox, we’re offering upgrade kits for $160. For those who have not yet purchased a FlightBox, you can add the AHRS components to any Dual Band or Single Band kit for $150. If you would prefer we do the installation, we offer upgrade services for $35. For more information on AHRS, please see the AHRS page. To order, please see the web store. I’m extremely pleased to announce that Open Flight Solutions has received FAA approval for FlightBox Pro, a new version of our FlightBox ADS-B / GPS / AHRS system which can be permanently installed in certified aircraft as a minor alteration. FlightBox Pro, priced at $675, provides weather, traffic, WAAS GPS, barometric altitude, G-force, and advisory attitude data to applications running on tablets, smartphones, and portable navigators. Coupled with a tablet and a mount, FlightBox Pro serves as the core of a powerful yet inexpensive MFD. 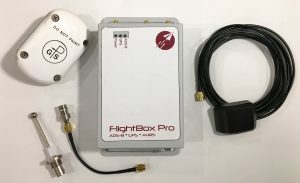 FAA approval means that FlightBox Pro can be installed permanently: mounted to the airframe; wired to the avionics buss; connected to external ADS-B and GPS antennas. A permanently installed system is more convenient, reduces clutter in the cockpit, improves ADS-B and GPS reception, and provides more accurate AHRS and G-meter functionality. Installation can be done by any licensed A&P mechanic or repair station. The process typically takes one to two hours – less if you have existing antennas. The FAA approval permits the installation of FlightBox Pro on any Part 23 / CAR3 airplane and any Part 27 or Part 29 rotorcraft. The installation is deemed to be a minor alteration under most circumstances, requiring only a logbook entry. FlightBox Pro is the first multifunction system to be approved under the FAA’s NORSEE policy. NORSEE stands for “Non-Required Safety-Enhancing Equipment”. The policy was created in 2015 as a simplified means of reviewing and authorizing products which have the potential to make flying safer. NORSEE is one of several efforts by the FAA to improve the safety of the legacy fleet. Other NORSEE-approved products include a line of iPad and iPhone mounts from Guardian Avionics – great for creating that MFD. FlightBox Pro is available for pre-order today and is expected to ship in April. The $675 package includes the FlightBox Pro, a dash-mount GPS antenna, cabin-mount 1090 and 978 MHz ADS-B antennas, SMA extension cables and an antenna mount bracket. We are also offering a number of adapters for those who want to connect their FlightBox Pro to external antennas that use BNC, TNCF, and other connector styles. Avionics shops and many A&Ps should be able to fabricate appropriate connections. Open Flight Solutions does not currently plan to sell external antennas. You can use inexpensive transponder / DME antennas (typically $25 – $35 each) for both ADS-B bands. Aviation GPS antennas are generally quite a bit more expensive, but you can often find used antennas left over from upgrades at a reasonable price. We tested FlightBox Pro using an AeroAntenna AT575-9 that had been connected to an Apollo GPS — it worked flawlessly. For those who’s A&P or avionics shop demand proof, here’s a link to the approval letter from the FAA.